High-rises dot Bahrain’s horizon in Juffair. Backed by generous support from the GCC, Bahrain’s economy is set to bounce back with a number of new housing cities planned and projects in other sectors worth billions of dollars. BAHRAIN’S construction sector can look forward to the New Year with more optimism than of late, given the increased spending on social housing, infrastructure and real estate. 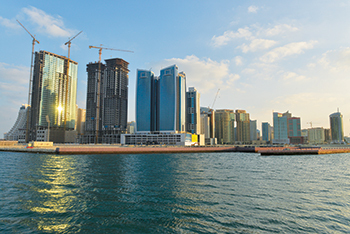 The financial aid from the GCC Fund – a $10-billion aid package approved in 2011 by the GCC states – is already making an impact on both the social housing and road construction segments of the market, where five new major townships are planned to be completed over the next five years and a target of 40,000 homes to be readied on a fast-track basis (see separate article). Key road projects such as the BD52-million ($138 million) Alba and Nuwaidrat Intersections project (enabling works) and the Muharraq Ring Road (Phase One) are under way, following the completion of the BD24.2-million ($64.2 million) Mina Salman Interchange, which has eased the traffic congestion in the port area and onwards to Muharraq. While the 40-km Friendship Causeway linking Bahrain and Qatar has suffered a number of delays, another causeway project – the second such development linking Bahrain with Saudi Arabia – might make it to the anvil earlier. With a price tag of $5 billion, the causeway includes a main line rail link and a second road connection. Plans to go ahead with the project have spelt good news to the industrial, manufacturing and trading sector, which has been suffering under the recurrent problems of congestion and delays at the existing King Fahd Causeway. The construction sector now awaits the launch of works on the second phase of the airport modernisation programme (AMP) for Bahrain International Airport, the enabling contract for which is expected to be announced shortly. “Construction work on the new terminal is to kick off in 2015 and all resources are dedicated to the success of this five-year journey,” a spokesman for Bahrain Airport Company (BAC) tells Gulf Construction. On the tourism front, Bahrain is poised to see the opening in the first quarter of the showpiece Four Seasons hotel at Bahrain Bay, a masterplanned island development that commands a strategic position in the heart of the capital Manama. Signs of a strong recovery are also apparent in the property sector, where there has been a 60 to 70 per cent increase in real estate investment projects over the past year according to Bahrain Real Estate Association chairman Nasser Al Ahli, who indicated that property trading was expected to top BD1.5 billion ($3.9 billion) by the end of last year according to market indices. In the industrial sector, the major project in the offing is the $2.5-billion expansion plan at Aluminium Bahrain (Alba), which involves the construction of its sixth production line and upgrades. According to the Oxford Business Group, a global publishing, research and consultancy firm, infrastructure projects worth an estimated $22 billion are expected to be rolled out in Bahrain before 2020. However, falling oil revenue may impact funding availability for some capital works, potentially cooling long-term prospects in the sector, said the report. The contract for the enabling works related to the modernisation programme for Bahrain International Airport is expected to be issued in the first quarter. Also in the offing is the contract for the main construction works related to the AMP programme. Last September, the Ministry of Transport invited contractors to prequalify for the project. This follows two key agreements signed to spur the modernisation project, under which Hill International will provide project management consultancy services and Aéroport de Paris Ingérierie (ADPi) will serve as design and engineering consultant. The scope of works on the main contract comprises the construction of a new passenger terminal, and other buildings including all general civil engineering, and mechanical, electrical and plumbing (MEP) works, aircraft parking, car-parks, interiors and exterior and other related works. When completed, the expansion is expected to increase the airport’s capacity to 13.5 million passengers a year. The first phase of the AMP was launched at the start of 2014 with upgrading and renovation works being done on the existing terminal – including new aerobridges with new high-tech scanning machines and the extension of the duty-free area. To spur its ambitions in the social housing sphere, Bahrain has turned to the private sector and has initiated a pioneering Bahrain Affordable Housing Public-Private Partnership (PPP) project. The $450-million PPP project entails the construction of 2,800 social and affordable housing units in Al Madina Al Shamaliya (Northern Town) and Al Luwzi. Hill International, a global leader in managing construction risk, has been contracted by the Ithmar Development Company to provide project management services for a three-year period linked to the PPP project. Work is now set to be launched on the construction of 1,560 homes in the Southern Governorate at a cost of BD75.56 million ($198.4 million). A housing contract has been signed between Bahrain’s housing ministry and Tamcon Contracting, a subsidiary of Al Khaleej Development – Tameer and Inovest, and its Saudi partner Naba International Commercial Enterprises. Another major housing development is the East Sitra Town project, the reclamation contract for which is now being carried out by the Abu-Dhabi-based National Marine Dredging Company (NMDC). Other townships are planned at East Hidd and Ramli. Significant progress has been made at Diyar Al Muharraq, a masterplanned waterfront community off the shores of Muharraq, with work under way on the Dragon Mall and dining street within Dragon City, an anchor component of the project. Occupying an area of 115,000 sq m in the southwest corner of Diyar Al Muharraq city, Dragon City offers wholesale and retail opportunities. Gulf House Engineering is responsible for the design and supervision, Nass Contracting for construction and Baker, Wilkins & Smith Middle East for cost consultancy services (see Real Estate feature). Work is also in progress on the next phase of the $6-billion (BD2.2 billion) Durrat Al Bahrain development off the southern coast of Bahrain. It comprises Fayrooz 800, which will feature 168 villas built across two petal-shaped islands at a cost of BD50 million ($132.62 million), including infrastructure work. Durrat Al Bahrain is co-owned by Kuwait Finance House and the government and includes five petal-shaped islands, six atoll islands, a central island and a crescent-shaped island. Another key development is Dilmunia, a mixed-use project being built on a man-made island off the coast of Muharraq. Two residential projects – Temara and Seavilla – within the development are reported to have been sold out while work is under way on a substation and The Treasure residential development being spearheaded by Bin Faqeeh Real Estate Company, the project’s first third-party developer. Two additional substations are due to be built in Dilmunia at a later date. Together, these three substations will power all of the Dilmunia island. With a unique health and wellness anchor, Dilmunia will include residences, hotels, leisure and shopping districts, and provide residents and visitors with wellness facilities and spas in a state-of-the-art resort-type environment. Among other projects, the foundation stone was laid late last year for a $100-million project to develop King Faisal Corniche into a prime leisure spot in Bahrain. The public-private partnership project will see the development of a 1.5-km-long corniche area that includes an open seafront area accessible to the public as well as a shopping centre, on the lines of The Avenues mall in Kuwait operated by the Kuwait-based real estate company Mabanee. The project is being developed by the King Faisal Development Company, which has been set up by private Bahraini investors in partnership with M H Alshaya, a leading retail company based in Kuwait, and Mabanee. Mohamed Salahuddin Consulting Engineering Bureau (MSCEB) is the lead project consultant and Gensler the design consultant. The project is expected to be completed by March 2016. Among the major health projects planned for Bahrain is the King Abdullah Medical City, which will be financed through a $266.3-million grant from the Saudi monarch. Designs for the complex, which will offer 264 beds, are being undertaken by Saud Consult (see Regional News). Construction of a new advanced public hospital in Bahrain is set to start this year as part of the GCC Fund. The BD31-million ($81.7 million) three-in-one complex in Muharraq will include a maternity section, a diabetes centre and a long-stay facility. The Health Ministry has allocated BD16 million ($42 million) to build the maternity hospital, which will accommodate 200 beds and operation theatres, in addition to care services for premature babies. Another major medical facility is the Al Salam Specialist Hospital, which is expected to take shape in Riffa. Khaleeji Commercial Bank (KHCB), one of the leading Islamic banks in Bahrain, has signed a corporate financing deal of about BD7 million ($18.2 million) for the construction of the new specialist hospital. Meanwhile, a BD31-million ($81.7 million) cancer care unit – claimed to be the first of its kind in the region – is being built at the King Hamad University Hospital (KHUH) in Muharraq. Leading contracting firm G P Zachariades has been awarded a contract to build the BD32-million ($84.87 million) national oncology centre, which is expected to be completed by May 2016. Featuring 120 beds, the centre will cover 57,000 sq m, including underground parking within the hospital’s grounds. Bahrain’s main hospital, the Salmaniya Medical Complex (SMC) is also being expanded at a cost of more than BD15 million ($39.5 million). The schemes include a BD5.6-million ($14.85 million) multi-storey car park, a BD6-million ($15.91 million) power station, a BD4-million ($10.60 million) outpatient clinic and a BD38,000 ($100,529) expansion of the accident and emergency department.